Welcome to Photo Art Friday! If you are new to this virtual art gallery where you can showcase your art created from your photographs, you can read the guidelines for participation here. 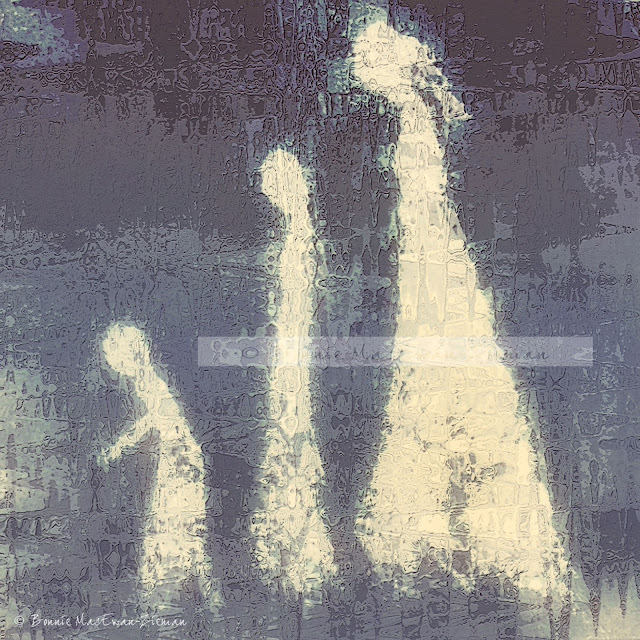 This piece was created from a mixed-media piece of art representing my three children. I placed a photo of the mixed-media piece on one of my textures. Blending it in Difference changed the grey figures to beige. The image was sharpened and light added with a levels adjustment. This piece uses one of my photographs of a giant puddle near a construction site. An image of a girl from the web was added. She is 'connecting' with the water by carefully dipping her toes into it. Several manipulations were made both in Photoshop and RadLab. I am writing this post on Tuesday as I do not know when my schedule will bring me back to the computer. My husband is scheduled for surgery Thursday morning and we do not know how many days he will be required to recuperate there. I doubt, therefore, if I will be available to comment on your photo art this week - so am counting on all of you to support each other's work. I will peek at each and every piece when I get the chance - wouldn't miss it! 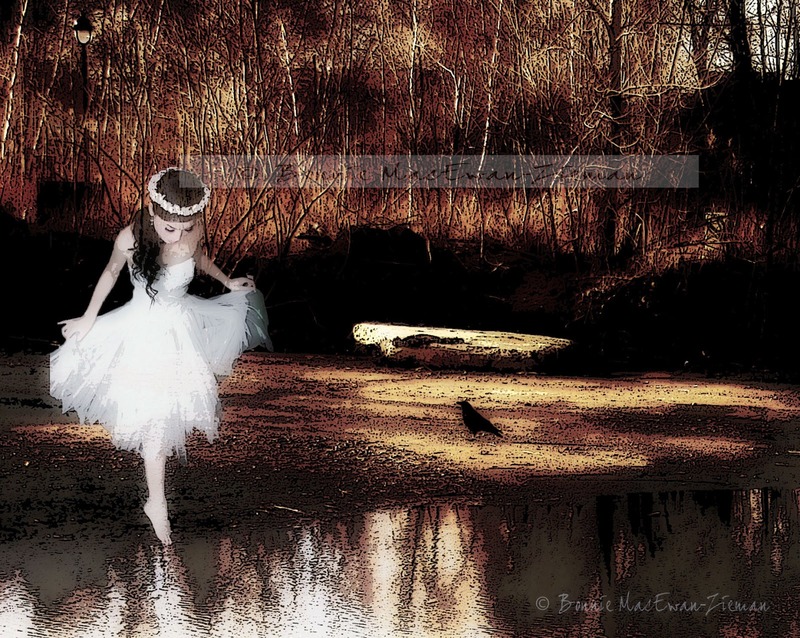 I LOVE that image with the girl and the pond-- and the crow watching her dip her toe in. It tells a story without words. Bonnie I love your images this week. You are so talented! I hope all goes smoothly for your husband and that he's up and around again real soon. I'll be thinking of you...the wait during the actual surgery is always soooo long. Hugs! Sending good wishes and prayers that all goes well today for you & your husband. Hoping your husband's surgery is fast to heal. Best wishes. Beautiful photos. Bonnie- you and your husband will be connected in our thoughts and prayers. Hoping all went well. Your images are stunning. The girl dipping her toe into the water is exquisite. I am looking forward to the day when I can place a figure so perfectly into my digital art. I hope everything goes well with your husband's surgery and he gets to come home soon. Bonnie, I'm sending prayers for your husband and his surgery...I hope all goes well. For some reason I can't see the first image? I only see a white square with a question mark...but your other two images are lovely! I especially like the girl dipping her toe...beautiful. I love what you did with these photos. The second one is absolutely magical! Sending prayers and healing thoughts to your hubby and hoping all goes well with his surgery. Superb imagery... I absolutely adore the first! Hoping all goes well, best wishes! I really love the first image! Hoping all goes well with your husband's surgery. I love the second shot of the girl dipping her toe in the water. Hope your husband's surgery went well. I love all of your pics....esp. the first one! Unique and fabulous! Your photos are so creative. I don't have your talent, but I do have fun on this, your meme. Thanks for hosting Photo Art Friday. Blessings to you as you tend to your hubby and may his recovery be swift. Your images always inspire . . . the first is my favourite. What a lovely picture of your children ... all connected by love. My heart goes out to you. I will have you, your husband and family in my prayers ... Take your time, do it right ... we will all still be here when you are done. Prayers in your behalf and for all to be well with your husband's surgery.. Your images are all coolish -- my favorite is the last one with the fingers touching.. sweet and prefect connection! I love the 1st one the best!!! Hope that your hubby's surgery went well and he is home recovering. Sending healing prayers your way. Loved you work this week. Especially the piece with the dancer. That was just magical. Here’s wishing you two some restful and healing days. Take care and let you hubby know we hope he has a quick recovery. Wonderful theme you have this week. That first picture is almost eerie cool. ..such a neat use of light, shadow, and texture. thank you once again Bonnie for the beautiful free texture. i had fun playing with it and adding it to my own photo work. 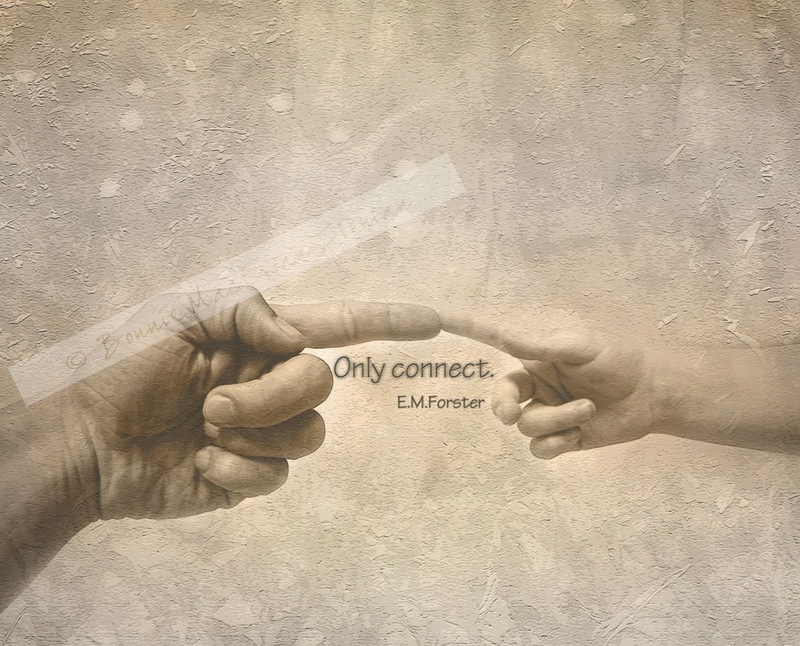 i adore your 'connected' pieces~! !~every single one~! the first one has such an interesting feel to it . . . very innocent somehow and just beautifully done and the second one is great fun. amazing that you can turn a photo of a puddle into a ballerina fantasy~! and the last one is so simple and to the point (forgive my pun) yet still tender and it has such a lovely and well placed light within it. you continue to teach me so much with your work. thank you. may your husband heal quickly and completely. Thanks, Bonnie, for another inspiring photo prompt. I enjoyed putting something together for the gallery. It's wonderful what a wide variety of imagery you put up yourself for this theme. Those creative juices are flowing in spite of the challenges you're facing in your daily life. I trust that your husband's surgery went smoothly and that you're both happily recovering now. The image of the ballet dancer is gorgeous - you inspire me a lot! I've just found your page and got so excited that I started playing with your freebie texture. Didn´t notice that linkcollection already closed. But I had a nice moment anyway! Thanks! Really enjoy your 'dipping toe girl'.